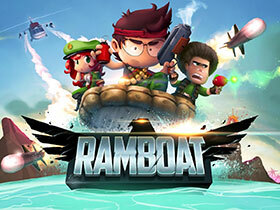 Ramboat: Hero shooting game – control a hero speeding on a fast boat and destroying the most different enemies with accurate shoots from powerful weapons. 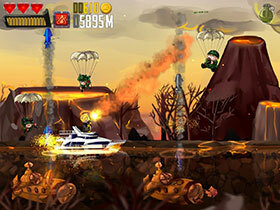 Speed along the water surface and avoid numerous traps in this Android games free download. Ride your boat along the coast firing soldiers and military equipment on the land. Shoot down planes and helicopters. Sink enemy boats and beware of submarines. Collect money and useful bonuses. Unlock unique character like a pirate, a cyborg, a mafiosi, etc. Buy different boats. 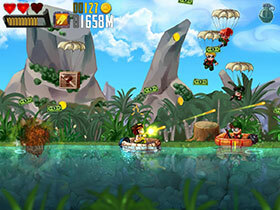 Ramboat: Hero shooting game– Which crew member will be the best shooter or poker player? What about the most powerful boats? The surfboard, submarine, pirate ship, or yacht? Find out by racing with them all! Discover all the missions and challenges! Test the firepower of all the weapons! Think you have the racing and shooter skills to make it out of this action packed adventure alive? -11 powerful boats – race a luxury yacht, a submarine, a pirate ship… or a hippo! 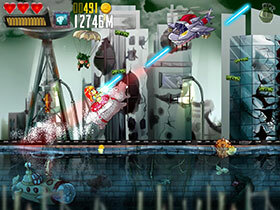 -Sick weapons – try the machine gun, rocket launcher, flamethrower, or classic pistol!